Fixing to plasterboard walls, and how to use plasterboard fixings. Advice on screwing into plasterboard with special fixings like the Redidrive, Nylon toggle, hollow wall anchor or the butterfly fixing to put up a shelf, mirror or picture. A very popular question to DIYdoctor is "how can I fix things to plasterboard walls?". There are a variety of fixing available just for this but what you cannot do is use ordinary wall plugs. The wallplugs do expand as you screw into them, but the plasterboard is soft and the expansion simply widens the hole you have put the plug into. In no time at all it will work loose. Our photographs below are done using a small piece of plywood as we did not have any plasterboard on site. Plasterboard comes in 3/8 inch and ½ inch sizes and is larger than the board we used. Any gaps therefore will not occur. Please note that none of these products will enable you to fix to lathe and plaster walls or ceilings. Please go to our fixing to lathe and plaster project for information about that. Note: Additionally, it is always a very good idea to run over the area that you are about to drill with a stud detector to make sure that there are no pipes or wires that you are about to drill into. To fix to plasterboard properly you need to use proprietary fixings. This applies to hollow doors also. Below are a variety of fixing available. This little beauty is called the Redidrive. 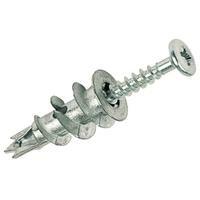 It is one of the strongest of all plasterboard fixings. The principle is simple. A pilot hole of 2 or 3 mm is drilled into the board and the redidrive bottom section is screwed into the hole. This is done without the screw in as the top of the Redidrive casing has a slotted head. It is not absolutely necessary to drill a pilot hole as the casing has a pointed shaft which will make its own hole when pushed and screwed. However if you have managed to choose a spot where there is a timber stud behind, the Redidrive will simply snap when it hits the timber and leave you with a hole you do not want. Drilling a tiny pilot hole will warn you if there is anything behind the board and also stop any movement in the Redidrive when you insert it. When the Redidrive is fully inserted, you simply screw whatever you need to fix, to the wall. In the images above, image 1 shows the face of the Redidrive when it has been screwed into the plasterboard. Image 2 is a section through the wall showing how it is simply a question now of screwing into the Redidrive and image 3 shows (in this case a towel rail bracket) something fixed to the wall. We use Redidrive for holding up kitchen units in plasterboard walls. They are good. 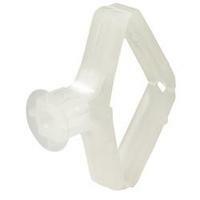 The second fixing we use is called a plastic or Nylon toggle. This is inserted (8mm hole for a medium toggle but always read the hole size on the packet first.) through a pre-drilled hole after squashing it flat. When a screw is inserted it goes through the hole in the back of the fixing and as you screw it, it pulls the back up to squeeze the fitting against the back of the plasterboard. Once again anything can be screwed to the wall now. This fitting is also very strong but, if used on their own, heavy items can tend to "tilt" the actual fixing in its hole and while they will not fall off, can become a little loose after a while. 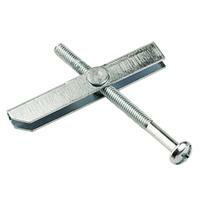 Ideal for shelf brackets which create a pulling force from the wall as well as a weight force downwards. Next comes the hollow wall anchor. Again used individually these are not ideal for fixing heavy objects but as with the toggle above and the spring toggle below, anything that creates a pulling effect from the wall is ideally held at the top with these. The hole is drilled in the board, an anchor pushed in. As the screw is turned it pulls up the body of the anchor. This grips the back of the plasterboard as you can see by the top picture. There is one hammer in fixing which we use a lot. 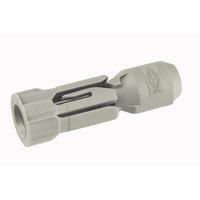 Its very easy to use, simply hammer in and it will take a fair bit of weight. Then we have the Spring (or gravity) toggle or Butterfly fixing. The principle is the same. A hole is drilled, the butterfly wings are held together while the unit is pushed into the hole, the crew is tightened to clamp your fixture to the wall. 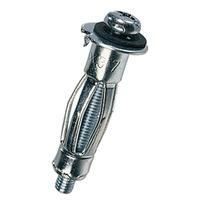 All the above are fixings for use in plasterboard which will give you the greatest strength. Below are images of fixings for jobs such as picture frames, dado rails, and general lightweight duties. You might like to go to our video section on fixings to watch the short film on spring toggle bolts to see how these particular fixings are used. We also have a video on hanging drywall in our video section and also a tutorial video on how to plaster. What Fixing Can I Use On Plasterboard?